I knew I wanted to feature Heather's brand, The Whimsical Fox, as soon as I first came across her work on Instagram. She makes the most unique, stunning baby and toddler rompers (and they are gender neutral, which is no small feat!). I absolutely adore her neutral aesthetics, complete with a touch of gold for the likes of me who can't resist a metallic accent. Even my husband was stunned with the quality of the romper when he saw it on our son and said "we need to buy more". Why, YES we do! 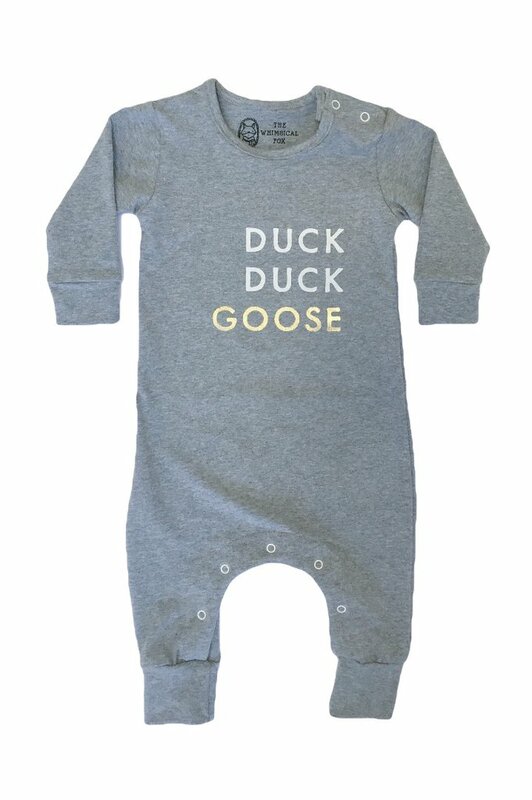 The rompers go from 3-6 months to 3T and you can choose between short or long sleeves. Check out The Whimsical Fox here and read about Heather's entrepreneur story below. ★ Could you please describe your business for our readers? 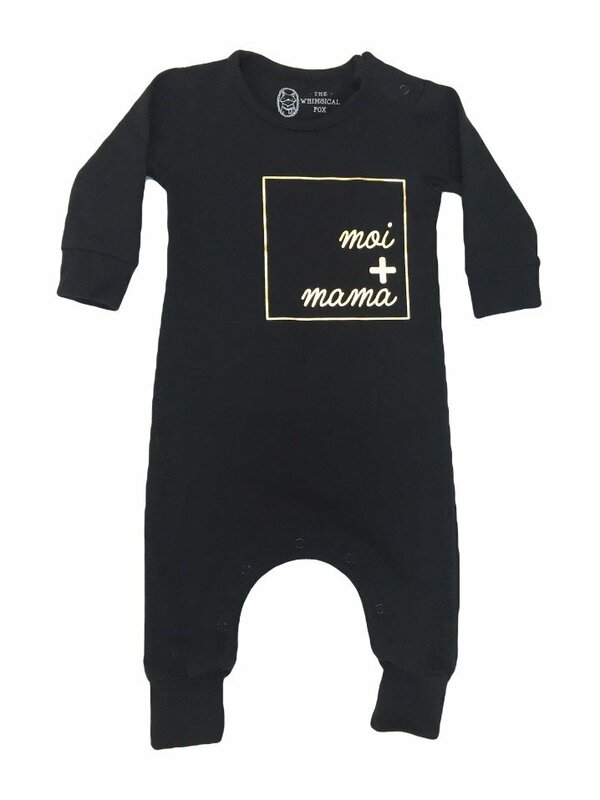 I design simple, modern and unisex rompers for little babes. ★ When did you start? June 16, 2016, I will never forget that day. I remember sitting in front of my computer and clicking the button for my site go live, I had butterflies. It was so exciting and terrifying, I was feeling all the feelings. ★ How did you decide to start? Were you inspired by your product and the need for it or did you want to start a business first and thought of the product second? Is it a full time job for you? I always knew that I wanted to have my own…..something, but it wasn’t really clear what that was was until we had our son Hudson. I would sit through those late night nursing sessions in a sleep deprived, zombieesque state (you all know the one Mamas) just letting my mind wander. When the idea for The Whimsical Fox came, it just felt right. Also, growing up I watched my mom run her own business (she was a carpenter) and raise three little girls. The work ethic and passion that she had was incredible and it proved to be the best example for me. ★ Was it hard to get things started? Can you describe the process? Yes, but anything that’s tough is worth doing. Finding balance and dealing with the extreme mom guilt was the toughest part. The thing that got me through was knowing this was the right choice for my family, for me I’m a better mom because I have this creative outlet. Finding the right suppliers and learning the business was tough, I learned some hard lessons but it was worth it to get to where I am right now with my brand….and I have so much further to go and so much more to learn. ★ How did your family react? Your husband? I remember telling him about my idea and that I wanted to start the business, I expected him to be totally blown away and incredibly surprised, but instead he looked me in the eyes and said “I knew we would have this conversation one day, you were always meant to be an entrepreneur.” I was all like, you get me. lol. In all honestly, I wouldn’t have The Whimsical Fox without the support of my husband, he’s the best. He hot glued 50 mini pom poms to a banner for me at 10pm the other day, after he came home from a 13 hr day at work. We support each other and get the demands of each other’s work, he’s my Fox hole partner through and through. ★ With social media, it is easy to fall in the comparison game. I believe women entrepreneurs should lift each other up - what has your experience with social media been like? 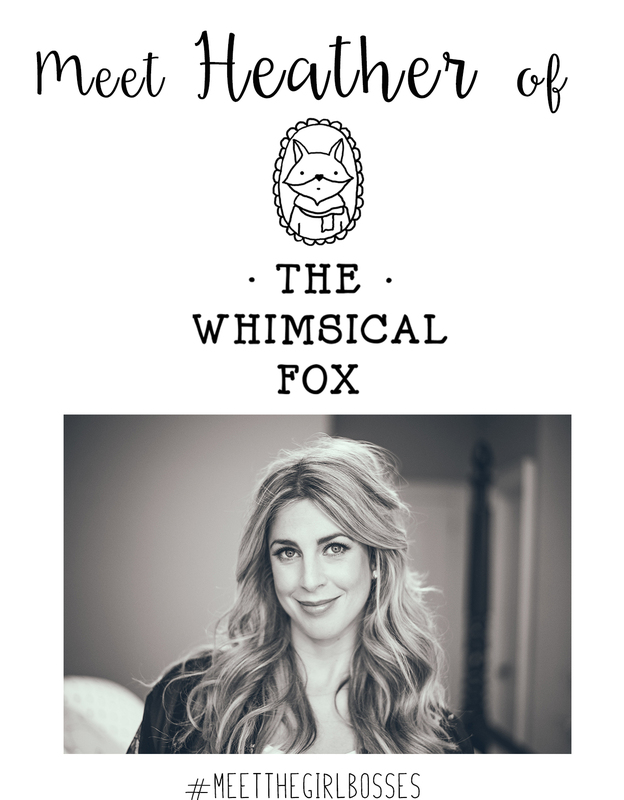 Before starting The Whimsical Fox I worked in Advertising agencies for 8 years, then client side for 3, and I can tell you that I have never been in a more positive and community based space then I am now. The day I launched I had several other shops promote me on their pages, I had someone do a post for me when so noticed I was close to 2,500 followers, she was encouraging her followers to check me out and help get me to that milestone, totally unprompted. That kindness is so touching to me, and it fosters such a beautiful community. #communityovercompetition is so real, I have been supported and lifted up by the beautiful people I have met on IG, I am so incredibly thankful for that. I’ve actually yet to come across any negativity at all. ★ What are your hopes for 2017? 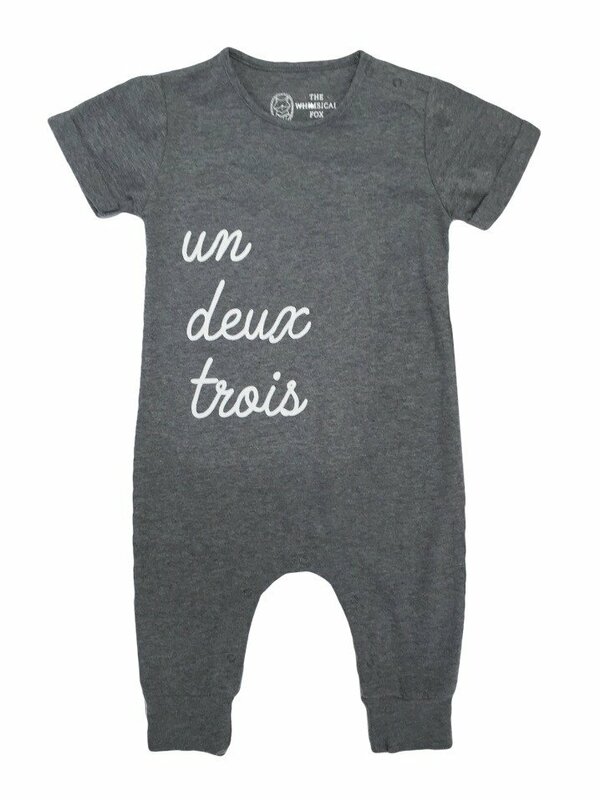 This May we are having our second little babe (yay new model for The Whimsical Fox, totally kidding…. not really), so my focus is on getting my Spring / Summer collection perfected and ready before he or she arrives. Then I am going to be at home with two under 2.5 years, so I basically just want to survive and shower a few times a week. I’m kidding. 2017 is all about striking up some cool partnerships and releasing some new product offerings, and ya know….keeping my kids alive and such. ★ What advice do you have for aspiring entrepreneurs? Surround yourself with a strong community. I have had the pleasure of meeting so many strong, talented and beautiful woman on IG that own their own shops. When I first launched I was blown away by the support these shops had for each other. We chat everyday and I think of them as my coworkers, we help each other out with questions and encourage each other, it’s actually amazing. At home my son is my source of creativity, my mom my inspiration, my sister and best friends are my cheerleaders and my husband is my rock and sounding board. I need all these people to be able to work towards my goals and I feel thankful for them everyday. I literally owe a million favours, it really does take a village. Do it now, do it now, do it now. I think I actually got this quote from the side of a Lululemon bag, it’s simple and it’s true. Life is way too short. And because she is totally awesome, Heather is offering a 10% discount to my readers this week (Jan. 9-15th) with code oraneboucher. Get your shop on here! Thank you so much for your inspiring words Heather. And congratulations on the new addition to the Whimsical Fox family!